Larry’s $80k wheelchair. Photo: © Glenn Francis, PacificProDigital.com. 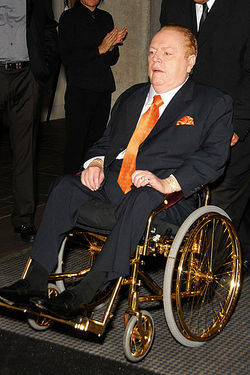 This sighting is gonna be hard to beat (cough): ~Larry Flynt~ was spotted at Quince with his wife—and let’s just say the gold-plated wheelchair (with red velvet pillows) was hard to miss. He was in with his wife to meet Phil Bronstein, and was reportedly seen complimenting co-owner Lindsay Tusk on the décor.